After 3 days of round-the-clock professional development thought I'd be mentally exhausted by last keynote - but instead I was really energised. Here are some of the notes I took while participating in Steve Wheeler's session on Learning Futures. Steve, from the University of Plymouth, talked about how the fact that there are many futures of learning, some of which included open, social, personal, mobile, augmented, and visual. 80% of the learning that we engage in is informal - and this learning is enriched by mobile smart devices connected to the internet. The wish to preserve the past rather than the hope of creating the future dominates the minds of those who control the teaching of the young. In that respect certainly education does need reform! He encouraged us to rise up against the tide and make better environments for our students to learn in. Schools have the best resources they need to make the difference - these are the teachers. Steve went on to talk about tethering education - often all the technology is in one room, for example. Instead, students should be moving in and out of lots of different rooms with their devices. He said if we force students to do things learning will not succeed. Schooling and education are different things. There are more mobile phones in the world than there are people, yet many students are not allowed to use them in school. He talked about how hard it is sometimes to try to introduce change - yet we are all change agents and often if we get opposition it shows we have pressed a nerve somewhere. He talked about using "positive deviance" - finding people who are in the area of opinion leadership and convincing them that things can change for the good. He said we have to model good behaviour and win the hearts and minds. At this time computers and keyboards are rapidly disappearing - we are controlling everything with touch, movement, even facial expressions. He asked: Is this a digital revolution or an evolution? Changes are happening and schools are running to keep up with them! Many schools are now spending money on iPads instead of textbooks - they are intuitive and connect quickly. He talked about the rise of Moblogging - blogging on the move to capture sounds, images and experiences. He said "multimedia took the world into the classroom, now mobile phones will take the classroom back into the world." We make a living from what we give, but we make a life from what we give. The future of learning is social - it involves connecting with each other. For example when you retweet something on Twitter you are not just repeating - you are amplifying: making the message go further and reach new people. That's why Twitter has become so powerful. Working online is working en masse: it involves the wisdom of the crowd where the whole is greater than the sum of the parts. On Twitter there are 95 million tweets every day, but the power of it is that you can follow the very best people in the world and get an individual response back from them. The future of learning is going to be personal - individual differences are going to be acknowledged. Blogging among educators is becoming huge - any teacher can now become a global educator. Steve encouraged us to tell people what we have learned each week in our classrooms: in the act of writing we are written. It's easy to set up personalised learning experiences in groups using appropriate technologies, activities and resources. He advised that it's better that students learn how to use personal technologies from us. We now live in a listening culture - look around on a bus or train, everyone has earphones on. Often people are listening to music, sometimes they are listening to something else - it's possible to use audio feedback for learning and in doing this we can help children to work better. We are seeing lots of different types of video and audio coming together to capture rich experiences. Steve went on to talk about content - he said it's not king anymore, now it's becoming a tyrant. How do students know which information is relevant and accurate? This has implications for teachers whose roles are becoming content curation, collaboration, facilitation and inspiration. Web 1.0 - used hyperlinking. Being able to link to anything changed our ideas, how we communicated, how we did business. Web 1.0 connects information. 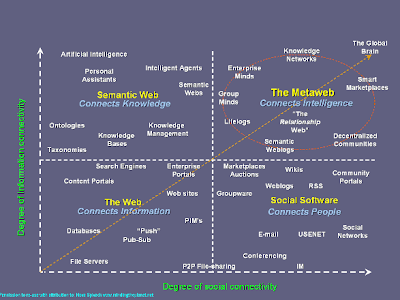 Web 2.0 - is more about doing things together and the co-creation of content. It's the social web that connects people. Web 3.0 - is connecting existing data for other, smarter users. 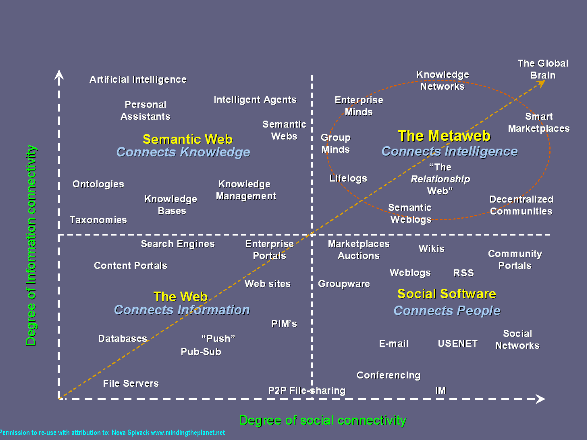 This is the semantic web and it connects knowledge. 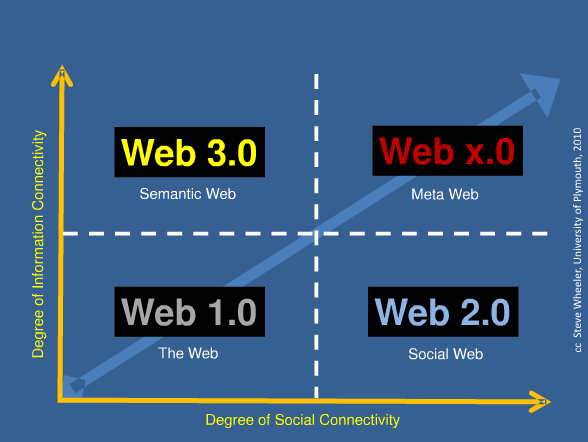 Web x.0 - is the metaweb. It connects intelligence.